- all using distance collaborative tools between two coasts and countries. This was a collaborative design / e-learning research project between two university professors/researchers (w/ their 4th year students) - from two different countries working with and about online virtual tools for design. exploring as a group that never met the issues of the "real" and the virtual. Original fashions for the event called "Ratava's Line" were designed and drawn by students at the FIT in NY. The drawings were then translated into 3D using a variety of software and tools by students at SFU in Vancouver. 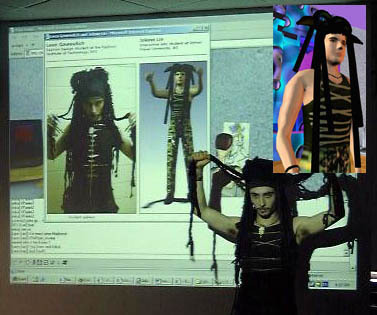 The fashion performance event included a narrative look of what is real and what is virtual (i.e. the fashion industry, computer graphics, media events, ...) so the students also collaborated on the character design, and the story writing, as well as the specific roles needed to put on an international, online and two city event.